dewaberita - Vendors from China, Huawei launched its tablet MediaPad ascertained Android 3.2 in the third quarter of 2011 to the global market, including Indonesia. "Indonesia is one of the countries targeted MediaPad first launch," said Chief Marketing Officer of Huawei Asia Pacific, Alan Wong, on the sidelines of the CommunicAsia 2011 exhibition in Singapore on Wednesday. According to Alan, launch preparations are very mature a matter of time. MediaPad measuring seven inches is using Qualcomm processor 1.2 GHz dual-core, capacitive screen with a resolution of 217 pixels per inch, GPS, 1.3 MP front camera, rear camera is 5MP. 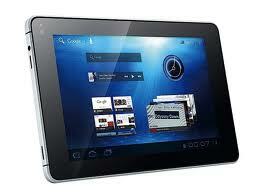 In addition MediaPad also features a dual 3G, WIFI facilities, as well as batteries with a six-hour endurance. In terms of ability, MediaPad can actually be said to rival Apple's iPad tablet computers, Samsung Galaxy and BlackPad BlackBerry's. MediaPad can play 1080p video, has eight GB of internal memory and microSD card expansion slot, and enriched with "bluetooth" and HDMI output, some software such as Facebook, Twitter, and Flash Player 10.3. Alan believes the quality features MediaTab into information technology devices that are capable of stealing the tablet market that already exists. Nevertheless, he did not specify how large the supply MediaTab that will be deployed in the global market until the end of 2011.Particularly in Indonesia, Alan is also reluctant to mention his sales targets. He only added that Indonesia is a large enough market to target and attract MediaTab. "We are currently selecting a few companies that will market the phone distributors of our latest tablet in Indonesia," he said.